Cameron Jamie's work--a blend of video, performance, sculpture, and drawing--deals with American history and culture, in particular their dysfunctional manifestations. Jamie's sharp critical gaze often focuses on popular culture and its impact on everyday life and the psyche. His work exposes the failings of the "American Way" and his methodology is informed by scientific and forensic anthropology. His intricate work has its background in the artist's own folklore and mythologies. Using American suburban culture as a case study, he analyzes how the structures of mythology are shaped and shared and the extent to which they participate in the creation of individuals' fictional worlds, fictional selves. 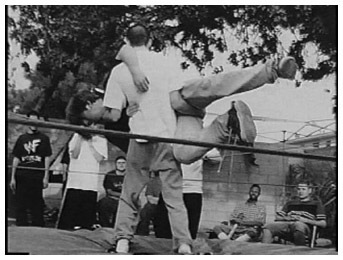 B B (2000) was filmed after a long investigation of the backyard wrestling phenomenon in southern California. For two years Jamie followed groups of kids in the San Fernando Valley, shooting videos, going to their wrestling shows, and integrating himself into this community. The film itself was shot with two Super-8 cameras and is superimposed with the timeless, demented, slow, and forceful music of the Melvins. The combination of the slow-motion, black-and-white images with this music creates a dreamlike state that reinforces a nightmare quality. The challenge of such a project was to avoid an exploitative relationship to its topic. Jamie is not interested in authoring "arty white-trash chic," or in depicting violence in a traditional documentary way. The dreamlike form of the film takes the documentary format to another level, to what he calls a "purgatory state of being," a middle ground that, in his view, is perfectly embodied in the notion of suburbs. In a recent project, Jamie documents homes that have been converted by their inhabitants into spook houses, dungeons, and torture chambers. He sees this phenomenon as equivalent to early French Grand Guignol, a theater genre of the late nineteenth century that specialized in productions designed to terrify and sicken through the display of violence and horror. Jamie looks at how such forms of theater are reinterpreted in the social theater of family life located in the American lower- and middle-class suburbs where he grew up. This idea of self-reference is at the center of the Goat Performance project, a one-on-one performance in which Jamie dresses as Dracula and explores the San Fernando Valley in the company of a guest. No photographs or documentation are made. The guest later gives a verbal testimony of the experience, which Jamie transcribes in a text; a hired portrait artist then produces a drawing related to the text. Jamie has shown his works in a number of group exhibitions, including Legitimate Theater, Los Angeles County Museum of Art, Los Angeles (2001); Try This On, Yerba Buena Center for the Arts, San Francisco, California (2001); and Let's Entertain/Au-délà du spectacle, Musée national d'art moderne, Centre Georges Pompidou, Paris, France (2000-2001). He has had solo exhibitions at the Chantal Crousel Gallery, Paris (2002), and the Centre national de l'estampe et de l'art imprimé, Chatou, France (2001). BB was filmed after a long investigation of the backyard wrestling phenomenon in Southern California. For two years, Jamie followed groups of kids in the San Fernando Valley, going to their wrestling shows, integrating himself into their community, and shooting videos. The slow-motion, black-and-white film was shot with two Super-8 cameras and is superimposed with the timeless, demented, music of the Melvins. The challenge of such a project was to avoid an exploitative relationship to its topic. Jamie is not interested in authoring "arty white-trash chic" or in documenting violence in a traditional way. The dreamlike form of the film takes the documentary format to another level, to what he calls a "purgatory state of being," a middle ground that, in his view, is perfectly embodied in the notion of suburbs. PV: But if we have to think about the economical side, how does that inform our practice? How do you maintain the heart of your programming? CB: The heart is no problem as long as it keeps beating. I'm looking for stories, because I believe everyone is interested in stories. Storytelling is a tradition we may be losing, but I believe that people haven't lost interest in good stories. Every curator has a personal touch. I've been curating since the early 1970s, not only film but performing and visual arts as well. My personal concern has always been with what story is important to tell right now. My approach to curating in the 1970s was completely different from how I curate now. The times and politics (in its broadest sense) partly affect my choices. CB: At the moment there is a greater need for social and political questioning than in the 1970s for instance. Two strategies in cinema are always guiding me strongly: cinéma modeste and cinéma d'urgence. Modest cinema and urgent cinema both stem from a need that stays close to a recognizable reality. At this time, I think this is more important than abstraction. Certainly when we talk about the moving image or cinema--and I'm not immediately talking about film related to visual arts--it's important that we offer images that the media doesn't show. It's important that we give a forum to artists who try to express their concerns through their films, who reveal their own cultural identity (without propagandistic goals) and try to give voice to the voiceless through cinema. This might be labeled political cinema, but there seems to be a need for such a political cinema these days, certainly in the world as it's turning now. We are living in somewhat desperate times, and it's important to provide questions, to make an effort to look at other cultures, and to listen to other opinions. We aren't living in a world of happy endings any more. Happy endings are what Hollywood is about. I like people to go home with more questions than when they came into the screening room, questions about what an image is, what they saw, what an image represents. Cinéma d'urgence and cinéma modeste are complementary to each other and invite the public to participate rather than to watch passively. PV: How do you define cinéma d'urgence? CB: Cinéma d'urgence is a cinema created out of a need, out of a concern. It often comes directly out of a personal conflict the filmmaker has in relation to his local or world experience. Cinéma d'urgence and cinéma modeste are both connected in spirit to a sixties idealism. But times and images change, so the approach to the subject matter changes as well. Cinéma réalité, cinéma d'urgence, and cinéma modeste are all interactive with one another and are experiencing revival at the moment. There is an urgency to give voice to some people, to find "truth." But what is "truth" and what is "reality"? It all depends on where you stand, and in the end film, video, and television will never reveal the absolute truth or show absolute reality because they are, fundamentally, lying machines. This doesn't take away my pleasure and interest in listening to the people who tell stories that are very important to hear right now: stories about forgiveness, tolerance, beauty, sadness, humanity, death, love, hate. It remains crucial, however, to question and reflect on what you see. For instance, these days I hear a lot of people ask, "Why do so many people hate the United States?" It's important to find this out, and through cinema (and visual arts) we can provide hints to possible answers. It's important to put an audience in an awkward and uneasy situation, to disturb them rather than provoke them. Provocation is an easy tool. To disturb is subtler, and it doesn't hurt anybody, whereas provocation is intended to hurt. PV: And what is cinéma modeste? CB: What I've been saying is, in fact, true for both. Cinéma modeste is, as I said, complementary to a cinéma d'urgence. It has a sort of fictional reality, as in the films of Abbas Kiarostami for instance. We sometimes also call it cinéma primitif. The elimination of all distraction around the characters and the story leads to a pure cinema focused on the essence of the human soul, of humanity, of being, of beauty. That's why Kiarostami is so revered. This is cinema that is close to the heart and immediately recognizable. It is the kind of cinema that goes back to postwar Italian neo-realism and films by Rossellini, de Sica, and others. Embracing the same sort of tension are works by Turkey's Gülsün Karamustafa and India's Sheela Gowda. In her installation Mystic Transport (1992; p. 205), Karamustafa gives poetic form to the issue of deterritorialization that is so much a part of our imagination when thinking about urbanization and late capitalist development in many of the locations selected for this project. Mystic Transport presents twenty colorful oriental blankets stored in twenty wheeled buckets. On one level we identify with the blanket as the smallest common denominator of nomadic populations. Karamustafa's strength in this particular work is in keeping the emotional association of the blanket with a body at a distance. The installation suggests that the audience/protagonist can manipulate and reconfigure the location of each bucket/blanket/body as he or she sees fit. This estrangement effect--wherein the audience is the center, the decision maker--raises questions about the responsibility of the viewer and the nature of his or her engagement. The seductive quality of the work does not sacrifice the content, and in fact it reinforces a concern for avoiding being overly anthropological. Sheela Gowda adopts a comparable, though not identical, pattern in her work And Tell Him of My Pain (1998/2001; p. 193). To create this labor-intensive piece, she passes an unbroken 700-foot-long thread through a sewing needle and doubles it in the middle. She then repeats this action with another eighty-nine needles, coats the threads with Kum Kum, and glues them together to make a 350-foot-long thin rope. Like a drawing in three-dimensional space, the long cord is installed in the architecture of the white cube, looping up and down the walls, across the floor, marking the physical environment. In many ways, this piece, and the work of Ranjani Shettar (pp. 233-235), can be read according to the sculptural language described in When Attitudes Become Form and by Krauss in her essay "Sculpture in the Expanded Field" as belonging to a modernist aesthetic of abstraction and dematerialization of space. But such a reading of the work would trap it in a mold cast by Euro-American language and its hegemonic, nominative strategies. Gowda works with traditional materials and traditional skills identified with female labor. In doing so, she produces a work that not only comments on a specific Indian cultural situation but also implies a critical stance toward art history, aesthetics, and the perception and production of artworks. The complexity of practices, in whatever media, associated with the notion of thirdness stems from the fact that these artists locate themselves on the periphery of dominant aesthetic models and distribution networks, but do not embrace a Manichean opposition to the question of form. They do not seek to reinvent language from scratch but instead choose to twist it, distort it, translate it. These practices lie in the narrow gap that Swiss artist Thomas Hirschhorn identified when highlighting the distinction between making political art and making art politically. Robin Rhode's work, merging hip-hop culture, fashion, sports, and other aspects of the every-day (pp. 225-227), seems to echo such a notion of thirdness and pulls it toward a resistance that is not necessarily oppositional. Rhode tries to identify a practice that allows him to take pleasure in the reductivness of youth culture and popular culture while remaining critical of them. The notion of thirdness, of in-betweenness, is central to the practices we are considering here as well as to larger theoretical constructs developed to analyze recent cultural shifts. For Homi K. Bhabha, thirdness is a key element in enunciating and conceptualizing a new international culture based on hybridity: "It is the inter--the cutting edge of translation and negotiation, the in-between space--that carries the burden of the meaning of culture." He locates culture in what he calls a "third space," a space that collapses new cultural practices and historical narratives. 26 Kum Kum is a red pigment used in rituals and as decoration. It is also used as a mark of marriage on women's foreheads. 27 Bhabha, The Location of Culture, p. 38. Cameron Jamie's work--a blend of video, performance, sculpture, and drawing--deals with American history and culture, in particular their dysfunctional manifestations.
. . . film, video, and television will never reveal the absolute truth or show absolute reality because they are, fundamentally, lying machines. This doesn’t take away my pleasure and interest in listening to the people who tell stories that are very important to hear right now . . .
Gowda works with traditional materials and traditional skills identified with female labor. In doing so, she produces a work that not only comments on a specific Indian cultural situation but also implies a critical stance toward art history, aesthetics, and the perception and production of artworks.